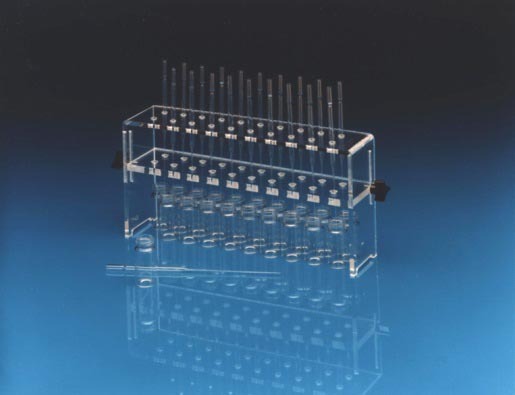 The Pasteur Pipetter Rack is adjustable and holds Pasteur Pipets above the receiving vessels. 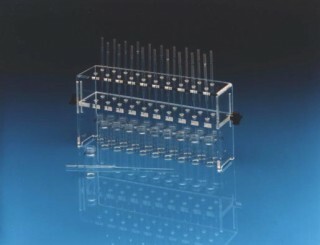 Receiver racks holds up to 20 long-tipped Pasteur pipets (15cm). The bottom support can be set to the necessary height. Column tip height can be varied from 1-1/3" to 3-3/4" above the lab bench surface. Generous 1" center-to-center spacing permits the use of a variety of receiving vessels, vials, flasks, etc. The MV-12, support rack maybe used with the rack for test tubes (12 x 75mm and 13 x 100 mm) and the MV-13, centrifuge tubes (12 mL) may also be used.